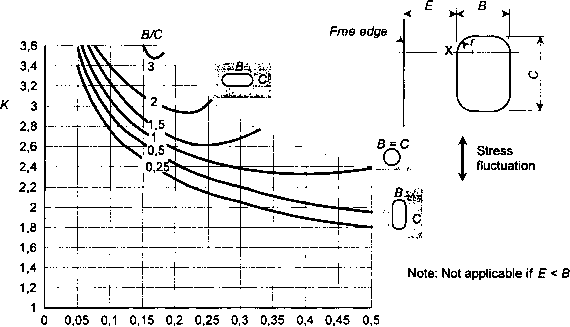 where A is the fatigue crack growth rate (FCGR) material constant m is the crack growth rate exponent y is the crack geometry factor depending on the crack shape, orientation and surface boundary dimensions. NOTE: The most common units for stress intensity factors AK are MPam0,5 (Nmm 2 m0,5) and for crack growth rate da/dN is m/cycle. Data given in B.3. are only valid for these units. (2) This can be rewritten in the form da/dN = A AKm where AK is the stress intensity range and equals Aa a0'5 y. (4) For the general case A, AK and m are dependent on 'a1. (5) For further information on fracture mechanics techniques, particularly for welded structures, see References B.8.1 and B.8.2.